This is a family of shield bugs in the superfamily Pentamoidea. They feed on plants sucking the juices from their hosts. Some species show maternal care of their eggs and nymphs. 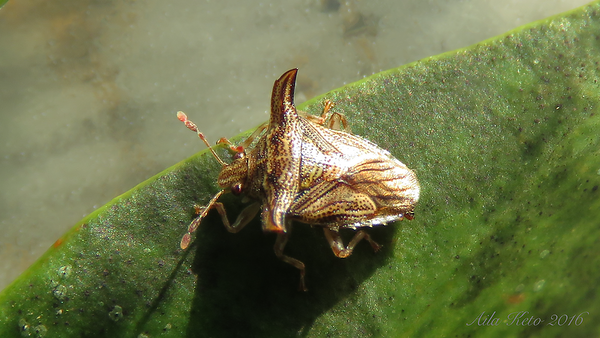 Panaetius trabifer Horváth (Acanthosomatidae, Blaudusinae, Blaudusini). This identification was based on the key in Wang et al. (2015). This individual measuring less than 5 mm in body length was found on Cryptocarya meisneriana (Lauraceae) on the ARCS property Lyrebird Wildlife Sanctuary. Some members of Acanthosomatidae are famous for showing maternal care for their eggs and nymphs which has been of immense interests to evolutionary biologists. There are strong suggestions of Gondwana origins for the Tribe Blaudusini.